So our Dreamer has progressed nicely along his or her journey and now we start to encounter challenges. Card number 15 is Ego in Angel Tarot and The Devil in the Rider-Waite (RW) tarot. In the RW tarot, we see a crouching Devil or the Horned Goat of Mendes with wings. He has one hand pointed upward and the other is pointing downward as he holds a torch to the tail of the young man in chains. Indeed both the man and woman are in chains but notice that they appear to be on very loosely, as though they could remove the chains should they desire. 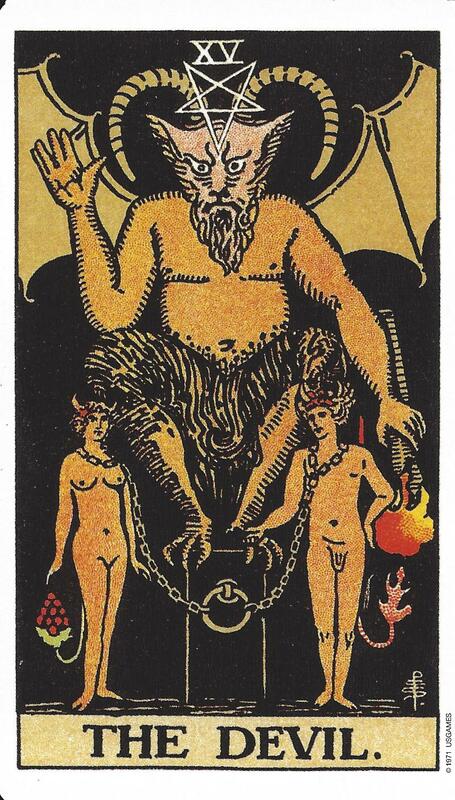 The Devil represents the Ego out of control.You can see the reversed pentagram at the head of The Devil. This is symbolic of trying to reverse the progress that our Dreamer has made thus far. In Angel tarot, we have our Dreamer with a mask on. He is temporarily blinded by Ego. He has lost sight of the path likely due to some overindulgence. All he needs to do is take the mask off and this represents our free will. We can continue to be led blindly by Ego or we can stop and start questioning. This is a detour for our Dreamer. In Angel tarot notice how his hands are in chains as he holds a pot of gold. It could be that he has lost sight of priorities and is now worshiping the god of money. He needs to find a balance between material goods and pursuing a more spiritual purpose. The crane at the bottom left represents spiritual enlightenment. He awaits our Dreamer to take off the mask, release addictions or dependencies and get back on the path to enlightenment. 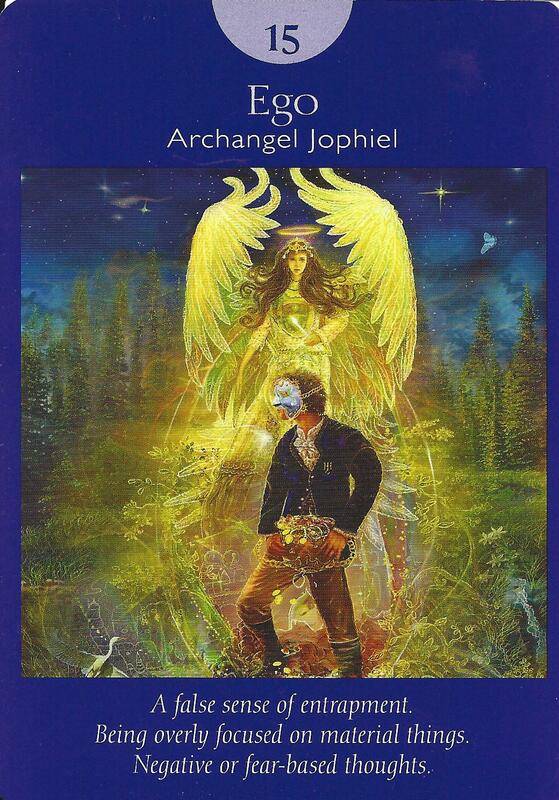 Archangel Jophiel stands by closely watching The Dreamer, trying to guide him out of his predicament. Her name means “beauty of God.” Whenever we feel we have succumbed to the Ego and we desire to change paths, we can call on Archangel Jophiel to help us rise above negativity and pessimism. She reminds us of just how beautiful and precious life can be. Card 15 is about the Ego gone mad; self-destruction. It represents too much; because honestly too much of anything can be a bad thing. In her book, The Creative Tarot, Jessa Crispin says, “The Devil could represent all of the Twenty-seven Club, the long list of musicians and artists who died at the age of twenty-seven, mostly from the consequences of substance abuse: Jimi Hendrix, Janis Joplin, Jim Morrison, Jean-Michel Basquiat, Kurt Cobain, Amy Winehouse, and so on” (p. 80). If you draw the Ego card it is a clue that there is likely an addiction or dependency that is holding you back. Heaven knows that you have physical needs while on Earth in this physical form. However, you may be out of balance. Question why it is you want these material objects. Be on the lookout for addictions, temptations, dependency, excess or any misplaced ideals involving darkness, deviance, and decadence.